The Easter weekend was a busy one for us. As is my wont in the school holidays, I was stricken with the sort of horrible germs that left me with a banging head, throbbing ears, chesty cough and a husky voice. “Like Mariella Frostrup?” I asked, hopefully. “More Les Dawson,” my husband confirmed. There was nothing I wanted more than a day in bed with a steady supply of chocolate digestives and hot tea, with something highbrow on the telly. Rather unfortunately, good old Daddy had recklessly, but faithfully promised the little badgers that we would be following my own advice and having a day at Alton Towers. It was perishingly cold, with an ominous, slate-grey sky and there was little that appealed less, but a promise IS a promise, so I necked some Ibuprofen and off we went. I was irritable and the kids were madly giddy; I threatened stopping the car and turning around approximately 35 times, and by the time we reached our destination, no two members of our family were speaking. It’s not an outing for us if there’s not some minor incident of family friction which makes me question why I considered leaving the house and I find it’s best to get it out of the way early on. It was my first visit to Alton Towers in years, and the children’s first taste of rollercoaster revelry. It was almost unbearably exciting. It turns out a) they are quite the little daredevils and b) I have lost my bottle somewhat. I used to love the most lively of rides; this time I found the Runaway Mine Train more than sufficiently lively, whilst the little one took it all in her stride. Is it old age? Or will repeated exposure build up my tolerance? Time will tell as we make the most of our season passes! We made a full day of it and by the time we got home at 7pm, I was chilled to the bone and exhausted. I had planned to make a cake, but once I had facilitated the Easter Bunny’s nocturnal workings, I was fit for nothing. My littlest lady had come home from school with an extremely detailed retelling of the Easter story. She was insistent that we must have a Simnel cake, though between us, all we really knew was that it was a cake (that was my contribution) and that it had to have 11 balls on top (hers). She’s only 5, I maybe should know more. Anyhoo, turns out that a Simnel cake is a fruit and marzipan cake, and seeing as at least 50% of my family would retch if presented with this, my little theologian conceded that any cake with 11 balls on would just about pass muster. We stocked up on Maltesers. The morning of Easter Sunday was predictably hectic, with chocolate to be eaten and trails to be followed, so I needed a recipe I could throw together quite quickly. I thought that something lemony might make the dismal outdoor conditions seem more Spring-like, so I made a three tier cake, based on the excellent recipe from the Hummingbird Bakery’s excellent Home Sweet Home book. I love their books and find the recipes straightforward and really reliable. If you’re after a baking book, I’d recommend one of theirs. I changed this a bit, because I couldn’t be faffed with with cream cheese frosting they recommended to go with it. There’s a good recipe here for something similar, if that sounds something you fancy, but I’m almost always lazy and use whipped cream instead. This time I was trying to be a bit fancy and added in some raspberries, but it wasn’t really necessary. I am unskilled and slapdash, so everything I make has the look of something assembled by one with only rudimentary fine motor skills, or indeed one with paws – as the picture attests – but it really did taste nice. The lemon sponges are light; the drizzle makes them very moist and the lemon curd makes it extra tasty. If you wanted to forgo the lemon drizzle and lemon curd, it would still be lovely. This is a fairly massive cake and would easily serve 10-12 so would be good for a party. Yours will almost certainly look more professional than mine. If you did want to make it for a party, the sponges could be made ahead of time and wrapped in foil and kept in a tin for a couple of days, or frozen for up to 3 months before filling. You’re going to need a mixer to make this, really. I have a stand mixer, which I love, but if baking’s more of an occasional fad for you, something like this VonShef Hand Mixer would do beautifully. This one has great reviews and comes with any attachment you could ever need, for approx £20. Yours will look better than this! I absolutely never bother buying buttermilk, though you can pick it up easily in most supermarkets. For this cake I squeezed half a lemon into 320ml milk and warmed it slightly in the microwave for 20 secs. You could use vinegar instead of lemon juice. You’ll know it’s ok when it looks lumpy and a bit revolting. If it doesn’t, then add a bit more lemon/vinegar. You will also need 3x sandwich tins, best lined – at least the base – with greaseproof paper. If you don’t line the sides, grease them very generously. Lemon curd – I had every intention of making some and was going to use this recipe, but absolutely couldn’t be bothered when it came to it and bought the Tesco Finest lemon curd, which was lovely and zesty and a lot less trouble. Add flour, baking powder, sugar and butter/Stork and and mix with an electric mixer until it forms a breadcrumb-y consistency. Mix the buttermilk, lemon zest and eggs together. Add the wet ingredients to the dry in two lots and mix until smooth and well blended. You’ll need to scrape down the bowl a couple of times to be sure it’s all combined. Pour the mix evenly into three sandwich tins. If you’ve only got two, or can only fit two in the oven at a time, that’ll be fine, just leave the spare mix on the side until you’re ready for it. Bake in the oven for approx 20 mins, or until they’re golden and spring back when you press them. If they’re not ready, check every couple of minutes. If one side seems browner than the other, then turn the cakes round. The cakes at the top will cook quicker, even in a fan oven. A few mins before the cakes are due out of the oven, squeeze the juice of one and a half lemons and add into a small saucepan. (Rolling the lemon on the worktop will help it release its juice more easily.) Add in the icing sugar, mix and bring to a boil. When the cakes are cooked, stab them all over with a skewer and spoon the hot drizzle liquor all over the hot cakes. Allow to cool in the tin for 20 mins or so and then tip out onto a cake rack. They need to be stone cold before you can fill them, so if you need to speed things along, pop them into the fridge or freezer for 20 mins and reassess. Whip the cream until it’s quite firmly whipped and will hold its shape. (Cream needs to be very cold to whip up properly so keep it in the fridge until you need it) If you’re doing this by hand it will take an age. If you’re doing it with a machine, watch it carefully. It’ll look like it’ll never happen and then in a second will over-whip. If it does go too far and won’t spread properly, you’ll probably be able to rescue it by adding in a dash of cream or milk and gently whisking it in until the consistency looks right. When cool, spread a layer lemon curd on each sponge and then a thick layer of the whipped cream. Stack. Try to make it less wonky than mine. Obvs the cake will need to be stored in the fridge, because of the cream filling, but the sponge is nicest at room temp, so I would recommend filling it only shortly before serving. Any refrigerated leftovers will still be delicious, but the sponge will be a bit heavier. Previous Post Beauty in the Aldi aisles. Next Post 11 steps to a brilliant night’s sleep. This cake looks amazing – and well done to you for braving Alton Towers feeling poorly! 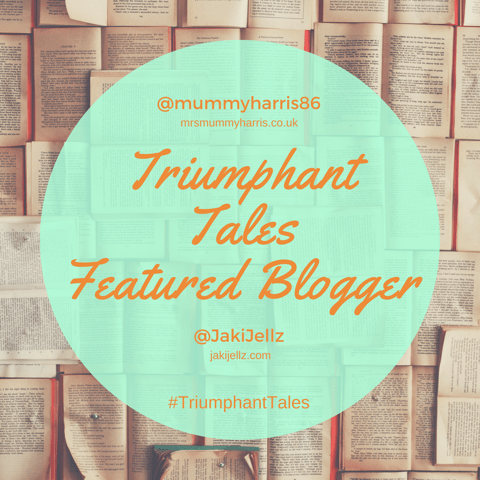 Thanks for linking up to #TriumphantTales, I hope you can joinme again on Tuesday.